Kodak launched its new KODAK Portrait 3D Printer at Formnext 2018. Kodak and Smart International, the authorized global brand licensee of 3D printing also announced the availability of the printer in North American and European market. The new printer is a significant overhaul to its first 3D printer launched in October last year. The desktop 3D printer comes with new distinctive features like a dual extrusion system and a fully enclosed all-steel structure, allowing high-temperature builds, and is complemented with enabling software and a wide range of high-quality materials. The dual extrusion system features automatic nozzle lifting and swappable PTFE and all-metal hotends for optimal material compatibility. Featuring an intuitive touchscreen, automatic levelling, and calibration, and preset print parameters for every material, the KODAK Portrait 3D Printer is ready to use straight from the box for those already familiar with the technology or newcomers with creative needs. The printer also has a sturdy steel frame with a fully-enclosed print chamber with HEPA and activated carbon filter, reducing unwanted odours and keeping fingers away from hot moving parts. In addition to the printer, users also get a free access to KODAK 3D Cloud, an IT-compliant printer management software created by 3DprinterOS. This software enables users to manage a print farm for any number of machines, in any number of locations, from anywhere in the world. Users can also access the 3D printer via Wi-Fi or LAN port and slice online, monitor their prints and receive over-the-air updates. 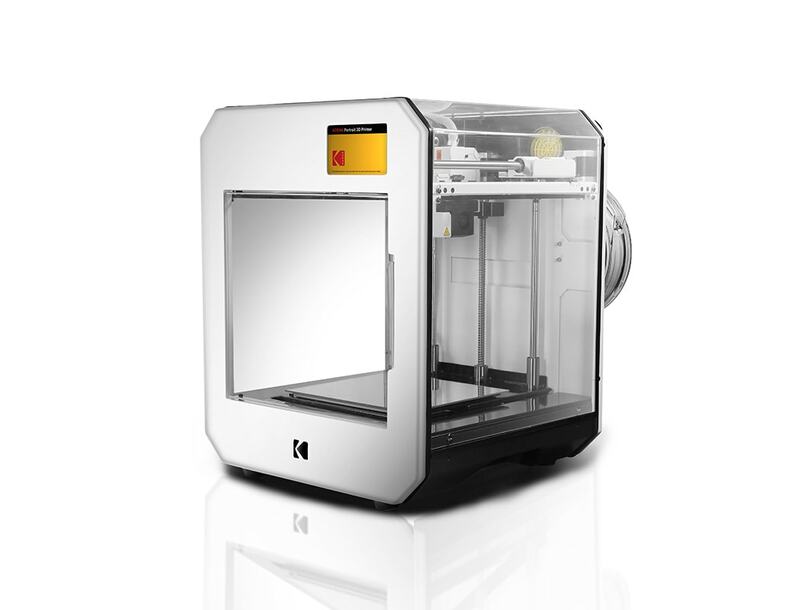 Kodak targets the desktop 3D printer market suiting environments like classrooms, laboratory, office or studio to print accurate models. The printer can print with a wide range of filaments like PLA, but also offer ABS, Flex 98, HIPS, PETG, water-soluble PVA and two grades of Nylon. Kodak manufactures all these filaments and they are packaged in such a way that they ensure low moisture and high dimensional accuracy, and come in a wide colour palette, including, of course, Kodak’s Trademark Yellow. About Smart International: Smart International has developed an ecosystem of solutions for professional 3D printing. Years of collaboration with engineers, designers, architects, artists, educators, have set the bar high. Only accurate and reliable technology with materials developed for a wide range of applications will help their creations endure and shine. About Kodak: Kodak is a technology company focused on imaging. Kodak provides hardware, software, consumables, and services to customers in graphic arts, commercial print, publishing, packaging, entertainment and commercial films, and consumer products markets.